This article was penned by Dave Flett and first appeared in The Yorkshire Evening Press, thanks to our leading local paper for allowing it to appear here. 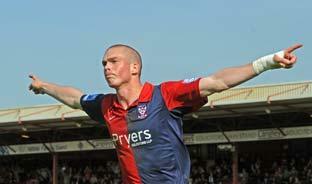 JEERS turned to cheers in 2009/10 as York City won back the support of the Bootham Crescent faithful. Although the campaign ended at Wembley in tears, next season should hold no fears for a club rejuvenated by the understated management team of Martin Foyle and Andy Porter. The ex-Port Vale pair both deserve great credit for overseeing a valiant improvement that exceeded pre-season expectations. Having only staved off relegation in the penultimate game of 2008/9, the omens did not look great when City’s last friendly of the summer ended in a depressing 3-1 defeat at UniBond League neighbours Halifax. Recent signing Craig Nelthorpe was also sent off in that game and, later that night, became one of four players arrested in a city-centre altercation. A turning point seemed to be provided, however, when a ten-man City side recovered from another red card for Richard Pacquette to steal a 2-1 victory at Gateshead. Exhilarating back-to-back home victories over Histon and Crawley then propelled the Minstermen up the table and underlined the potential of Foyle’s newly-assembled squad. The start of the New Year provided the wonderful high, however short-lived, of taking the lead at Premier League side Stoke. City eventually lost the tie 3-1 but gave an impressive account of themselves and hammered Hayes and Yeading 4-1 in their next league match. But then came the wobble. Without warning, Brodie’s name disappeared off the scoresheet for 16 matches due to a dip in form and suspension. A seven-match run without a win, including five defeats, extinguished all title hopes, saw the club dumped out of the FA Trophy and also threatened to derail their play-off push. A defensive masterclass, especially during the second leg at a hostile Kenilworth Road, then saw off the challenge of free-scoring play-off semi-final opponents Luton after another pair of 1-0 victories, City’s 12th and 13th of the season. Foyle is now concentrating on strengthening his squad over the summer. As he looks to improve his options, the City chief will probably recognise an over-reliance on Brodie to score goals and might look for a little more attacking dynamism from midfield. In the meantime, if "Chasing Rainbows" can be adopted by a club desperately in need of its own anthem then so much the better. A total of 25 players made senior appearances this season – the least number since 1994/5. In 2000/1, 38 players were used – a club record. There were no ever-presents with James Meredith (55 + 1) and Michael Ingham making the most appearances. City completed five league doubles over Gateshead, Kettering Town, Kidderminster Harriers, Mansfield Town and AFC Wimbledon. Eastbourne Borough and Salisbury City twice beat the Minstermen. City suffered only ten league defeats, the best since 1992/3 when they were beaten nine times. Richard Brodie’s tally of 27 league goals, including play-offs but not including the three against Chester, equals the best since 1983/4 when John Byrne netted 27. Brodie’s overall record of 34 goals has only been bettered twice in the club’s history. In 1928/9 in City’s last season in the Midland League prior to their election to the Football League, Scottish centre-forward Jimmy Cowie netted 56 times (league 49/cup 7) and in 1954/5 Arthur Bottom scored 39 goals (league 31/cup 8). The total number of league goals conceded, 35 (44 games), is the lowest in the club‘s history. The previous best was 38 in 1973/4 from 46 games. The average home league attendance of 2,664 is the third-best since the club dropped out of the Football League.